10 Things We ALL Do When We’re… In Love! We’ve all been in love at some point in our lives. And more often than not we fall head first in love - with nothing else occupying our minds but our significant other (s.o). Reading his old texts again and again, talking about him - here are 10 other things you’ll totally relate to if you’ve recently found love. More often than not, you find yourself sitting on your own, looking out at nothing, with a silly grin on your face. You can’t help it! Your s.o has taken over your daydreams, and you don’t mind it one bit! This is the most well-known way of dealing with being lovestruck! Its super cheesy, but you probably have noticed how your playlist has morphed into nothing more than mushy songs about love. Given a choice between DJ Waley Babu and Pehla Nasha, the latter is the obvious choice! You know it, your current squeeze knows it, but you won’t stop till the whole world knows about it! So you take to Twitter or Facebook to profess your love without fear. 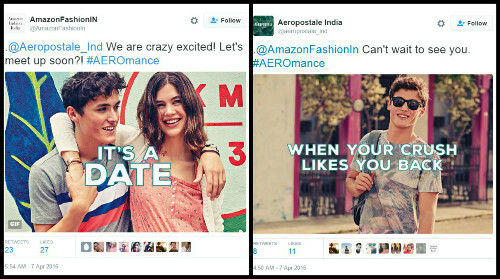 Just like Amazon and Aeropostale took to Twitter to exchange a host of lovey-dovey tweets when it was announced that Aeropostale was coming to India exclusively on Amazon. Perfect example of a lovestruck couple! If your schedules are a bit hectic, then you know the struggles of wanting to see your babe daily but not being able to do so! *Pouty face* Now all you can do is countdown the days till you get to be in their arms again. And if you’re lucky enough to meet your love interest daily, you still tend to countdown the hours till you can see them again! You love shopping but now you don’t make it all about you anymore. Now you’re always on the lookout for things that your bae might like! 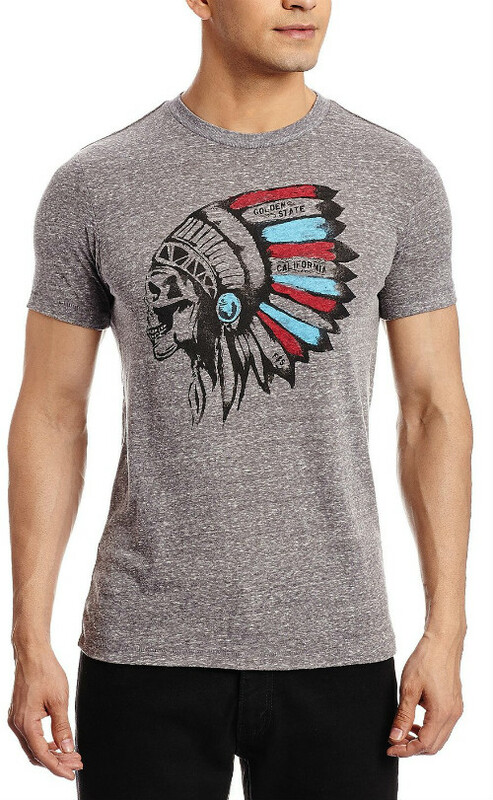 Consider shopping on Amazon for cool men’s clothes from Aeropostale to spoil your favourite guy! 7. Talk about it ALL THE TIME! You take every chance you get to talk about your new found love - whether you’re talking with your friends or family or someone you’ve just met! You can’t really put into words how happy you feel but that’s not stopping you from trying. 8. The need to look good...always! You want to look good for your better half. Although, you know they’ll still love you, regardless of what you wear, but you still want to make an effort. Our current favourite? The Aeropostale collection exclusively available on Amazon. It has some pretty cool stuff to keep your s.o interested and keep you in high spirits. 9. Don’t care about those phone bills! So you get home after a date, all smiles and butterflies still fluttering in your tummy. What do you do next? Whip out your phone and call your love, of course! Because the few hours you spent together were just not enough. You want to know everything he is up to. And the phone bills are going through the roof! But that is a very small price to pay compared to the immense joy you feel when you get to speak to them all night! 10. Want to share every moment together! You wish you could share every moment with your love. When you go somewhere without him, you always wish he was actually going with you. From watching amazing sunsets to eating weird foods, you want to be able to share every experience with your s.o. * This is a sponsored post for Amazon. Shop the Aeropostale collection here.